This beautifully designed book features dramatic new photographs of the collections and exhibitions housed in western Canada’s oldest, largest and best-loved museum. 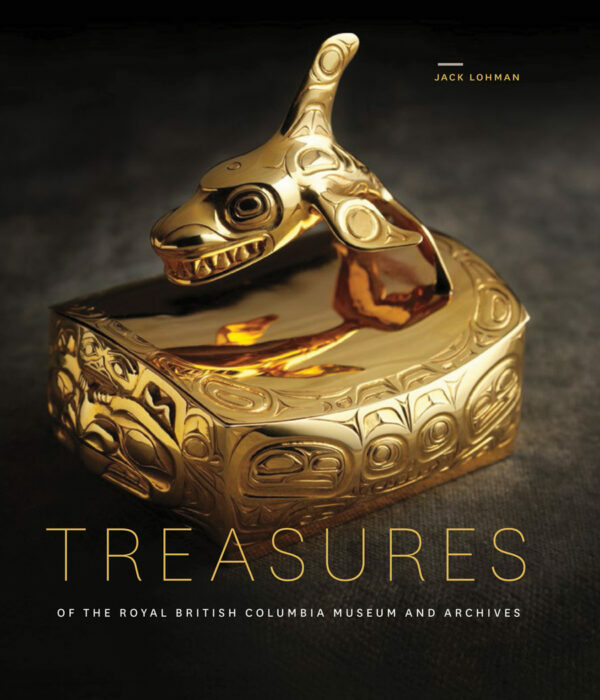 It is introduced by CEO Jack Lohman, who created the book as part of a far-reaching revitalization of the Royal British Columbia Museum. Lohman also contributes an insightful essay about the importance of museum collections and supports his argument with four more specific essays from Ethnology Curator Martha Black, Botany Curator Richard Hebda, Archaeology Curator Grant Keddie and former Provincial Archivist Gary Mitchell. Treasures of the Royal British Columbia Museum and Archives celebrates not just the richness of museum collections but their importance to culture, science and our understanding of British Columbia’s place in the world. The Royal British Columbia Museum is renowned for its authentic and evocative exhibitions, but there’s so much more to discover behind the world-famous dioramas and displays. The collections housed in the museum and archives include millions of plant and animal specimens, and great numbers of historical and archaeological artifacts, photographs, films, audio recordings and fine art, such as the world’s largest collection of works by Emily Carr. Treasures of the Royal British Columbia Museum and Archives features full-page colour photographs of artifacts and specimens selected from its vast collections and celebrated exhibitions. In the essays, Jack Lohman argues how museum collections are vital to our understanding of nature, culture and the world in general; Martha Black discusses the evolution of collecting First Nations art and artifacts since the museum opened in 1886; Richard Hebda relates the natural history collections to our growing understanding of ecosystems, biodiversity and climate change, locally and globally; Grant Keddie explores the importance of archaeological collections to the study of long-term cultural development; and Gary Mitchell recounts the history of archival collecting in BC and the importance of having a central repository for the province. Dr Martha Black is curator of ethnology at the Royal British Columbia Museum and the author of Out of the Mist. Dr Richard Hebda is curator of botany and earth history at the Royal British Columbia Museum and the co-author of Saanich Ethnobotany. Grant Keddie is curator of archaeology at the Royal British Columbia Museum and the author of Songhees Pictorial. Professor Jack Lohman is chief executive officer of the Royal British Columbia Museum and the author of Museums at the Crossroads. Gary Mitchell is emeritus provincial archivist for the British Columbia Archives.